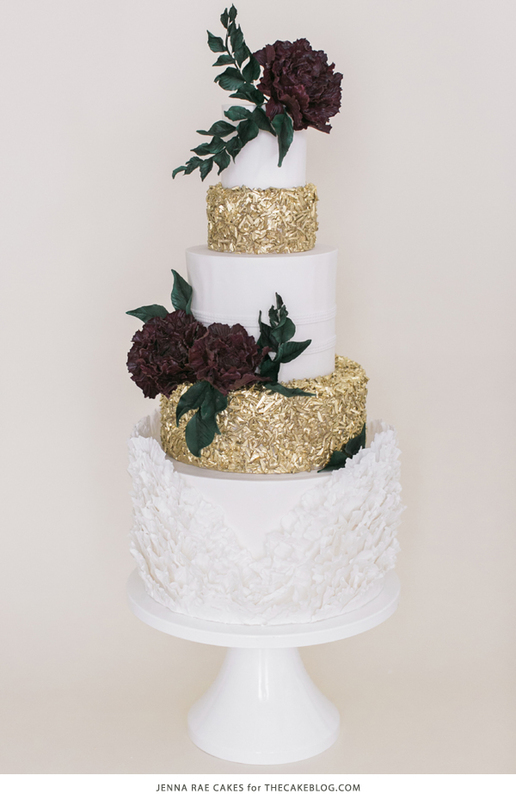 It’s day four of our brand new cake series – The 2015 Wedding Cake Preview! We’re spending two weeks oohing and aahing over marvelous cake designs and getting the scoop on 2015 cake trends from the ladies who know. Top cake designers were asked to predict which cake trends will be hot in 2015. Based on their insights, this talented group got busy creating innovative new cakes, exclusively for this cake series and especially for you! I hope you’ll join us as we debut a new trend-inspired design each day. At any point, you can catch up with the entire cake series HERE. We’re wrapping up the week with cake number four! Our fourth design builds on one of the hottest trends from 2014 – sequins! 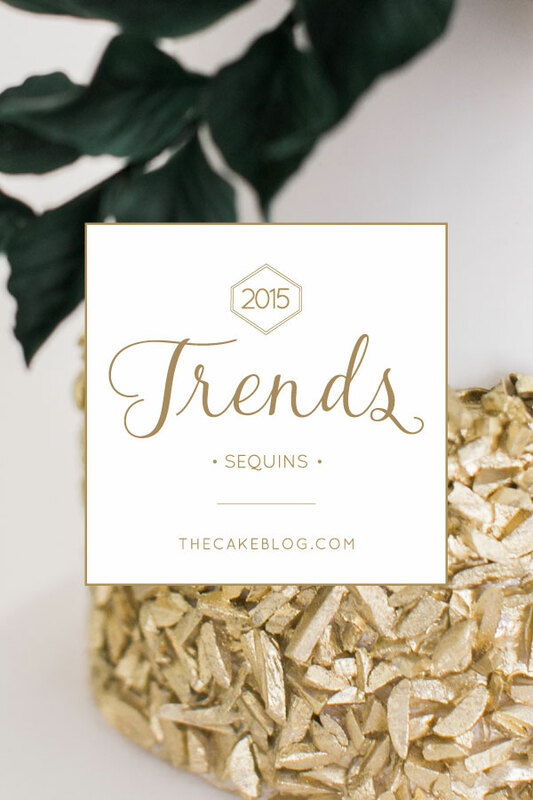 Sequin cakes were everywhere last year and are sure to remain popular in 2015. Today’s cake gives us a new way to love these textured tiers, paired with a bold pop of Marsala, the 2015 color of the year. The fourth cake in our series comes to us from Jenna and Ashley Illchuk, owners of Jenna Rae Cakes located in Winnipeg, Canada. Jenna and Ashley have a way with all things beautiful and a style that is soft, feminine and downright fabulous. 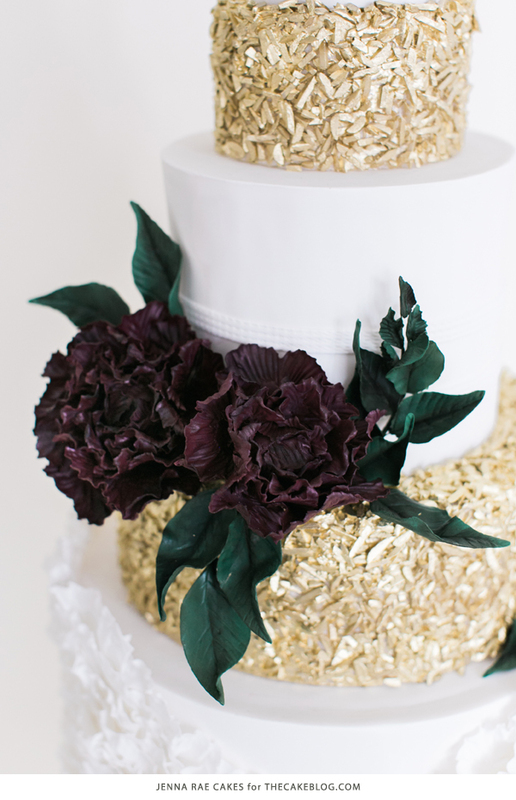 Jenna’s silver sequin cake left us speechless back in December 2013, only to be followed by one of the most gorgeous cake tutorials we’ve ever posted. Ever ever. If you missed it, now’s the time for you to click back and see how to make a sequin cake! When Jenna and Ashley invited us in for a bakery tour of their new storefront last December – we wanted to take up residence in this little slice of cake heaven filled with lovingly styled displays and an abundance of delectable desserts. Always on the front end of trends from fashion to fondant, these ladies know a thing or two when it comes to style. 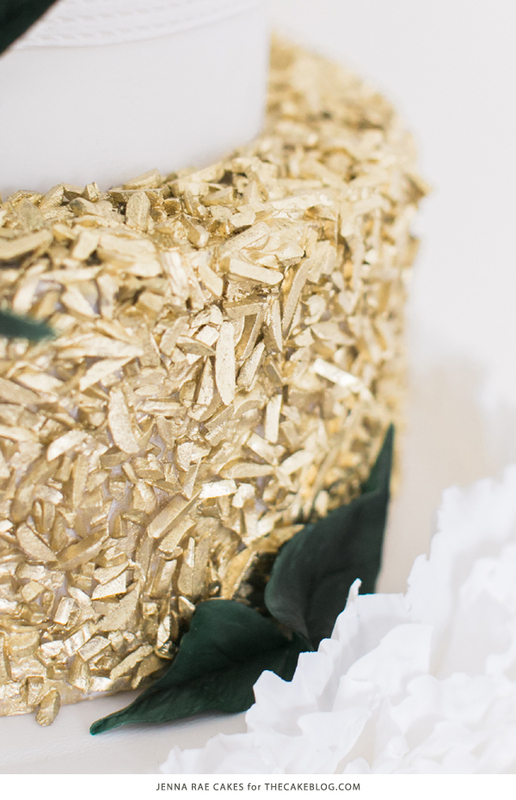 Today Jenna is bringing us more of her incredible sequins, with a new twist for 2015. With even more texture to love, these gold metallic tiers are filled with sliver-shaped sequins that have us guessing – what are those made of? 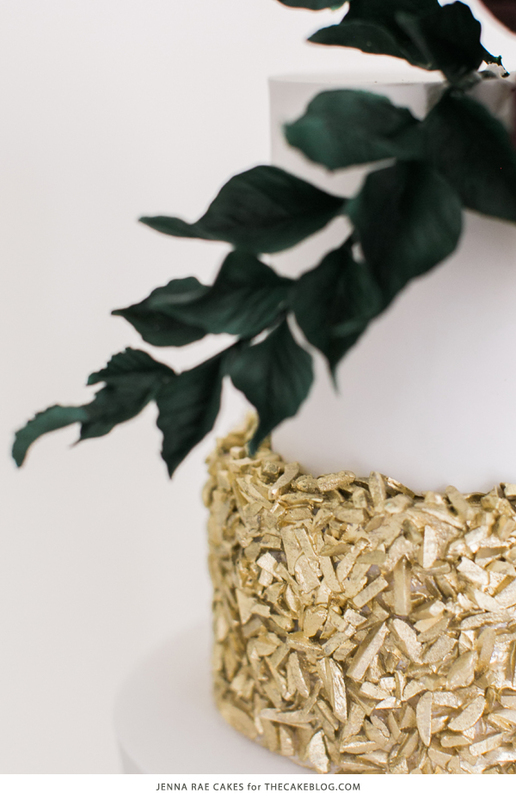 A cross between a shimmering sequin gown and the glamorous square sequin tablecloths that keep popping up on our pinterest feed, this new shape of cake sequins is seriously gorgeous. 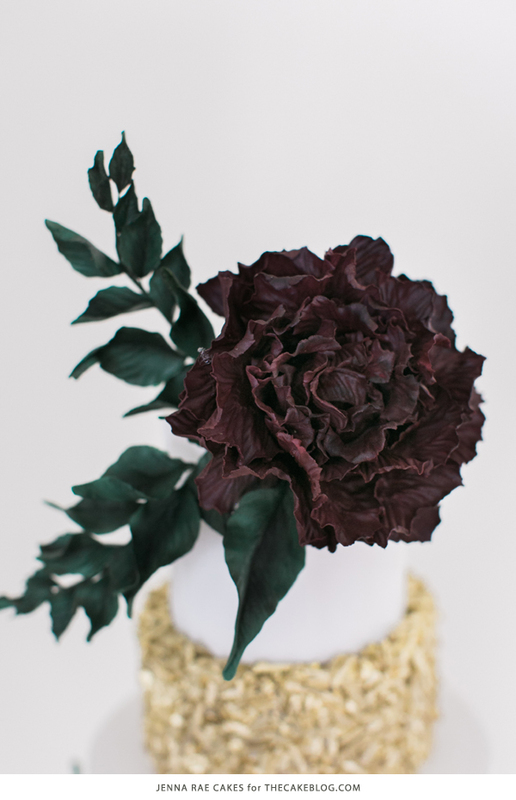 Add in statement-making blooms in rich Marsala and an entire tier of plunging ruffles and you have this little lovely….